It’s time to say goodbye to your endless To Do list that leaves you feeling overwhelmed, tired, and on edge! Join Shannon Egan, of Ishiki Insights and Luly Azizi, of Creative Cove for a half day coaching + creating workshop for your mind, body, and soul. Do you feel like you never have enough time to get everything done? Do you find yourself feeling too guilty to say ‘no’, leaving you trapped in unwanted commitments? Do you chronically overload your schedule? If so, you’re not alone. These days, hustling to get it all done is the norm. Somehow, we’ve come to believe the idea that we can fit it all in. We say ‘yes’ without really thinking about it whether that’s putting 16-hour days in at work or constantly putting your family’s needs before your own. Being massively overcommitted leads to overwhelm and exhaustion. It’s not sustainable yet we can’t seem to step off the hamster wheel and create space for what matters most in our lives. If you’re feeling the burn out and you’re ready to live by design instead of by default, join us for CARVE what you CRAVE! Submit your email address below to be the first to know about exclusive Early Bird pricing and receive 3 bi-weekly Mindful Escape emails to start carving out time for YOU. 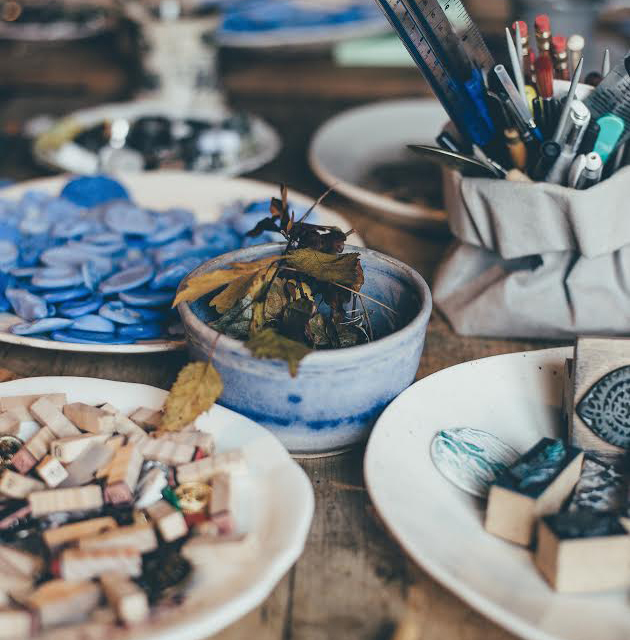 Luly Azizi, Founder of Creative Cove, will teach you how to carve away the non-essentials using the mindful practice of block printing. Using the materials we provide, you’ll carve a personalized rubber stamp and create your very own ink stamped shoulder tote bag – perfect for trips to the yoga studio, farmer’s market, or as a gift for someone special! If you’re ready to carve out space in your life to focus on what truly matters to you, join us for a mindful escape on Sunday, June 4th, from 10am – 3pm. We can’t wait to share this unique experience with you! Block Printing is one of the oldest types of printmaking, and has been around for thousands of years. You use carving tools and a carving block (usually wood or in our case, rubber). Since there is such a long history of block printing, many different techniques exist but the core process involves using a carved material covered in ink to transfer an image onto paper or fabric. Images printed with this technique are typically much bolder than other types of printmaking: since the blocks are carved by hand, there is often less detail and more texture to the prints. Block printing is also a great way to produce a something that is truly handmade, but that can also be very easily replicated. Carving the block is a therapeutic process which takes time and patience, but once you have the block you can use it hundreds or thousands of times!